Between two rounds of a stomach virus and our amazing trip to New Orleans and Biloxi to learn all about Gulf seafood, I haven't been in the kitchen much over the past couple of weeks. Never fear...I'm sharing one of my favorite recipes from 2014 with you today. I originally created these fun Sopapilla Cheesecake Bites for #SundaySupper last April, and they quickly became one of last year's most popular recipes. This five-ingredient treat is proof positive that a recipe doesn't have to have a mile-long ingredient list to be delicious. Sometimes simple really is best! Using ingredients that I always have in my kitchen, I can whip up a batch of these flaky pastries in about 30 minutes. They make a great weekend breakfast, a special treat with a cup of tea or coffee -- or even a great dessert for your next Tex-Mex feast! If you've never tasted a sopapilla before, it's a Tex-Mex dessert of fried dough that's tossed in cinnamon sugar and drizzled with honey. The only way I could think of to make the original better was to stuff it with creamy cheesecake filling! I always have a package of puff pastry in my freezer. It's one of my secret weapons for making simple appetizers and desserts that only look complicated...now, it's YOUR secret too! With this magical ingredient in my freezer, I'm ready for sudden cravings. For these sweet puffs, squares of puff pastry are filled with sweetened cream cheese and baked. Just before serving, they're generously covered in cinnamon sugar. Let me show you how easy these are to whip up. Step 1: Preheat oven to 425. Line a large rimmed baking sheet with parchment paper, and place the sheet of frozen puff pastry on top. Make the cheesecake filling by combining the whipped cream cheese, vanilla extract, and 1/2 cup of the sugar in a medium bowl until completely combined. Step 2: Cut the puff pastry into nine squares (three across and three down). Separate the squares and place a generous tablespoon of the cheesecake filling in the center of each square. Carefully fold the puff pastry into a triangle, completely enclosing the filling. Use a fork to completely seal the edges of the puff pastry. Make sure to seal them really well to prevent the filling from leaking out during baking. Sprinkle the tops 0f each pastry with a bit of sugar. Bake until golden -- approximately 12 minutes. Turn the pan halfway through baking for even browning. Step 3: While the pastries bake, combine the remaining 1/2 cup sugar and the cinnamon in a shallow dish. If some of the filling leaks from the pastries during baking, don't panic -- they will still taste amazing! While the pastries are still hot, quickly toss them in the cinnamon sugar on both sides. 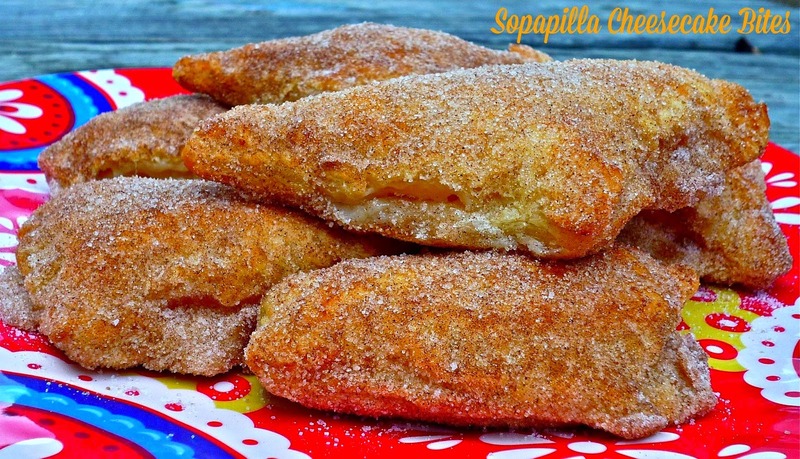 Place the sopapilla bites on a colorful serving platter and sprinkle with any remaining cinnamon sugar -- the more, the better! Let the pastries cool for at least 5 minutes before eating, because the filling is lava-hot right out of the oven. As you can see, the inside is flaky, with the creamy center. These festive sopapilla bites are so decadent you'll never believe that they're so easy to make using simple kitchen staples! The outside is crispy, and the inside is creamy and rich. The generous coating of cinnamon sugar brings everything together perfectly. You can definitely serve your sopapilla bites with honey to make it even more authentic! Everyone who tries these sweet pastries goes absolutely crazy for them, so why not whip up a batch for your family?